On March 25, 1970 a sellout crowd packed the Honolulu International Center Arena to witness another outstanding professional wrestling card by promoter Ed Francis. In the opening match, Hahn Lee pinned Bad Boy Shields. In other matches, Tank Morgan took two out of three falls from Jackie Carson. 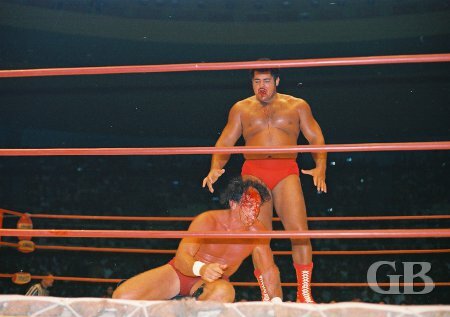 In a special event, Giant Baba defeated Les Roberts in a one fall television curfew match. Hahn Lee powers an arm bar on Bad Boy Shields. Tank Morgan attacks a downed Jackie Carson. 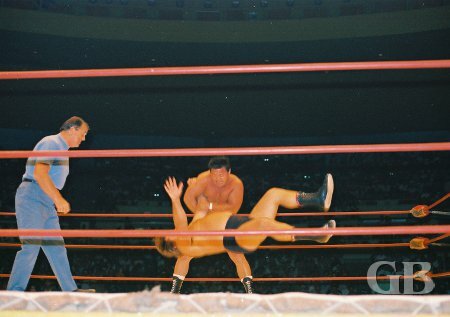 Giant Baba about to chop Les Roberts on the ropes. Baba gives Les Roberts the boot. 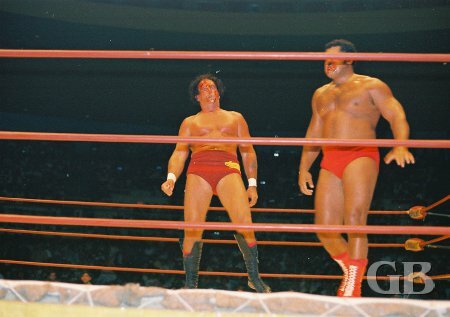 Cyclone Negra and Spiros Arion won the international tag team match when Kenji Shibuya and Mitsu Arakawa were disqualified after each team had won a fall. Ripper Collins successfully defended his Hawaiian title by taking two out of three falls from Rene Goulet. 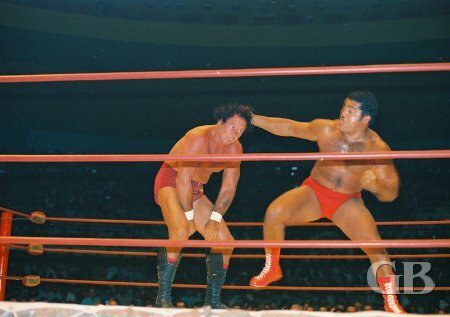 Mitsu Arakawa delivers a karate kick to Cyclone Negra who is being held by partner Kenji Shibuya. Rene Goulet body slams a pink Ripper Collins. The main event for the night was a Sicilian Stretcher Death Match between Pedro Morales and Handsome Johnny Barend. The rules for this match were that there were no rules; falls do not count. Anything goes and the match will continue until one wrestler is unable to continue and must be carried out of the ring on a stretcher and the winner must walk out of the ring unassisted. Southpaw Pedro Morales set to deliver a haymaker to Johnny Barend. Another blow to Barend's forehead. From the moment the bell rang to start the match, both Barend and Morales started fighting in and out of the ring with each other. At first it looked like Morales was out cold and the stretcher was brought in to remove him. But as Morales was being put on the stretcher, Hahn Lee, who was acting as Morales' second, started reviving him. Morales got up and threw the stretcher to the ground, re-entered the ring, and attacked Barend. Morales started throwing blows to Barend and managed to cut open Barend's forehead. As Barend started to bleed, Morales started biting away at Barend's forehead. Morales then managed to apply a sleeper hold on Barend. Barend went under and laid unconscious in the ring and was put on a stretcher and removed from ringside. Johnny Barend, now bleeding from the forehead, staggers around the ring after receiving a blow from Morales. Pedro Morales, with Barend's blood dripping from his mouth, moves in for the kill. As Barend was lowered from the ring, he made a last attempt to grab hold of the ring ropes but fell unconscious. Morales in the meantime was also on the mat and began to crawl toward the ropes. He used the ropes to lift himself upright and walked out of the ring unassisted and was declared the winner of the match. 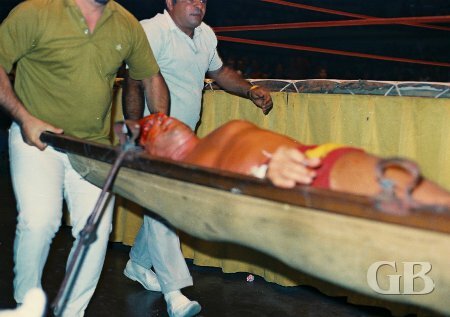 Johnny Barend being carried out of the ring on a stretcher.